We are excited to feature local artist Janie Ball today. Many of Janie’s pieces are currently being exhibited at Local Works right now! Visit Janie’s website to see her latest pieces and learn about upcoming shows. I am beyond grateful to live here surrounded by so much natural beauty, as well as, a city with its colorful living history and working waterfronts. I truly love where I paint. In fact I use #lovewhereyoupaint on social media. I am drawn to landscapes that have a sense of place. Often the subject is a location in which man and nature are coexisting side by side. Walking out my front door I’ll be inspired by a colorful fire hydrant surrounded by Indian Blanket Flowers. The same type of wildflowers that grew along the beach paths in the sand dunes and I picked growing up here as a child. It is often my personal relationship with the subject matter that resonates and compels me to paint it. I would have to say that I have several different styles of painting. I have found that my mood, music, and surroundings influence which process I engage in. That process can change daily. My abstract expressionism paintings are created using large palette knives on stretched canvas. These require a large workspace and, at times, working on a flat surface in order to build up layer after layer of thick paint. It is a very physical labor-intensive process of applying the oil paint over time, allowing the paint to dry between increasingly thicker layers of paint. I describe my studio paintings as contemporary realism. They are inspired by reference photographs that I have taken locally, or during vacations in say New Mexico, or while painting in Maine. I’ve recently started a painting series of rusty old trucks and dinghies, which I’m really excited about exploring further. Being an artist can mean you work in isolation a good bit. As a counterpoint, I enjoy painting en plein air studies. 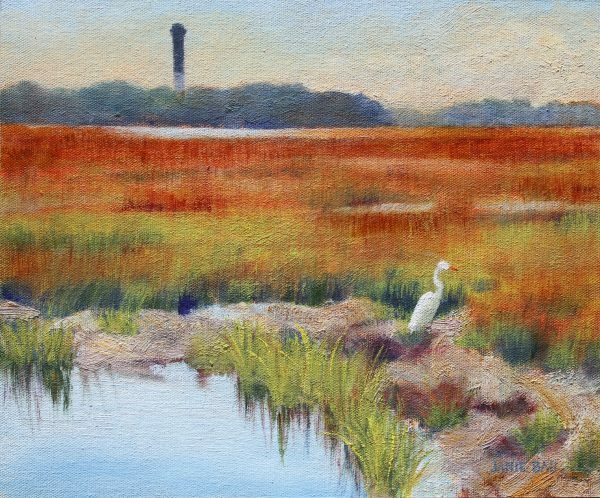 Once a week, weather permitting, I meet up with the Sullivan’s Island Plein Air Painters at a predetermined location be it in downtown Charleston or Sullivan’s Island. For me, the process of painting out together is social. Being part of a painting group is a chance to check in with other artists and share our mutual love of painting. I am indebted to Leslie Pratt-Thomas for introducing me to this inspiring group of women artists, which includes Collective artists; Anne Darby Parker, Lynn Hamontree, Susie Callahan, and former members Mary Hoffman and Elizabeth Middour. My most personal source of inspiration is my grandmother, Anne Barnwell Ball. Anne was a prolific plein air artist and a member of the Charleston Artist Guild during the 1950s and 1960s. She, unfortunately, passed away in 1970 when she was 53 and I was a year old. So I never knew Anne. I never got to paint with her. Instead, I grew up studying the details of her watercolor paintings of downtown Charleston, Sullivan’s Island, and the shrimp boats of Shem Creek. So here I am 50 years later painting in the same city and sometimes even in the same locations that Anne did. WHY IS SUPPORTING ‘LOCAL’ IMPORTANT? As a Charlestonian, I feel that we all have a unique responsibility to be stewards and advocates for preserving and strengthening the community we live and work in. I am a proud Loyalist member of Lowcountry Local First. In fact, when I’m painting out in the Charleston community, I’m more often than not wearing a LLF “Local” t-shirt because it’s so vitally important to support local artists. One of the founding principles of Charleston Artist Collective is that we are committed to gifting 5% of our sales to a local nonprofit. It is important to us as artists and community members to give back to where we live and work. Since it’s founding in 2010, the CAC has given over $100,000 to Charleston-area nonprofit organizations. As you know, we love co-working and collaboration! How has the Charleston Artist Collective impacted the way you engage with the artistic community here in Charleston? I believe the best thing about being a Charleston artist is that the artists organically support and lift each other up. It is not unusual for artists to be helping each other to reach higher and achieve goals that might have been out of reach without these relationships. I’ve spoken with artists from other regions and countries and this is not always the case in a field that can be very competitive. 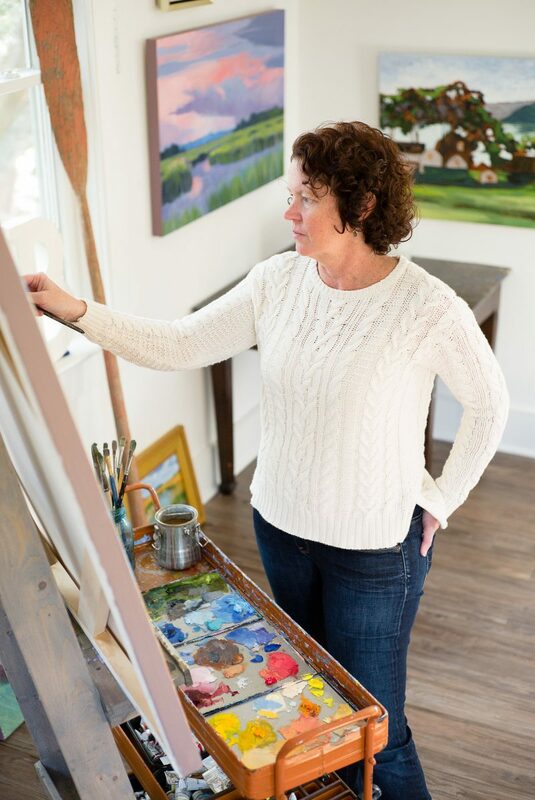 Being selected as a member of the Charleston Artist Collective instantly connected me to the other artists in the Collective, expanding my sphere. I guess the best way to put it is that there is strength in numbers. We have a greater presence as a group of artists and a larger impact as donors than I would ever have as an individual artist. Being a member of CAC means that I’m part of something much bigger than myself, my website, and social media presence. As a direct result of my partnership with Charleston Artist Collective, I have participated in numerous group and regional shows, and having my first solo exhibition of my paintings, here at Local Works. While the Collective was founded as an online gallery and has operated as such for the last five years, we are all very excited to truly be a traditional “Local” business having opened the Studio at 414 Wilden Street in Mount Pleasant’s Old Village.